Ssshhh!! Dont mention the D word!! 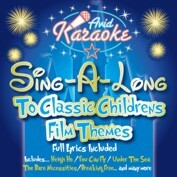 For AVIDs latest Karaoke korker weve taken a deep breath, cried 'Heigh Ho' and got to work on the greatest childrens film themes karaoke CD ever! We have covered all the 'Bare Necessities' from 'Under The Sea' to 'Hakuna Matata' and from 'Circle Of Life' to 'I Wanna Be Like You' . Its been a wonderful musical journey from classic early songs like 'Whistle While You Work' to modern classics like 'Breaking Free' and 'Thats How You Know'. And we never even mentioned the D word, whatever that is! !